Let me share my little secret to writing great blog titles – Keyword Winner. I will Analyze Keyword Winner with stats, facts and figures to help you understand what it’s all about and show how you can also use it to generate SEO friendly titles that can rank well in search engines. Before I review the product some official details. Keyword Winner is a paid WordPress plugin when installed on a WordPress blog, can help you do Keyword Research WordPress admin area and help you analyze the competition for the keywords and the number of backlinks you need to rank well for those phrases. It also helps with keyword suggestions to fine tune keyword research and find the ultimate title for posts that can rank well in Google and generate more traffic. Though I mainly use the keyword research functionality of Keyword Winner, it does have other modules like rank tracking for posts and how you are doing in search engines. Where I use Keyword Winner? And on my Technical Analysis Blog. One thing you may notice – everything is red in IMTips and the main reason for it is – You would hardly find keywords that is low on competition but then you can use Keyword Winner to find titles that can rank you well even when the competition is fierce like I do. How I use Keyword Winner? From time to time I visit my blog posts that gets some traffic and optimize them further to generate more traffic. When I re-visit my old posts my main focus is on the headlines because having a good headline is critical to getting people to read your blog post after they see the headline in Google. Let me show you an example where I am generating 10 times more traffic to one of my post just because of simple change in title. I purchased Keyword Winner few months’ back and have started using it on my blogs but this actually means I don’t have optimized titles for my old archived posts. From time to time I visit my blog archive to find posts that get some traffic and edit the post to optimize the title further so I can generate more traffic. Normally I edit posts title and so cannot show you exact stats before and after the edit because I don’t keep track of date and time of change but for one post I thought of not changing the title but making a fresh new post because old post needed improvements on some points. Looking at the stats I was shocked and I am sure you will also experience the same shock now. So be prepared. When I revisited the old post few months back and hit the Get Keyword Winner Suggestions buttons I am sure I saw something like this at that time as well. 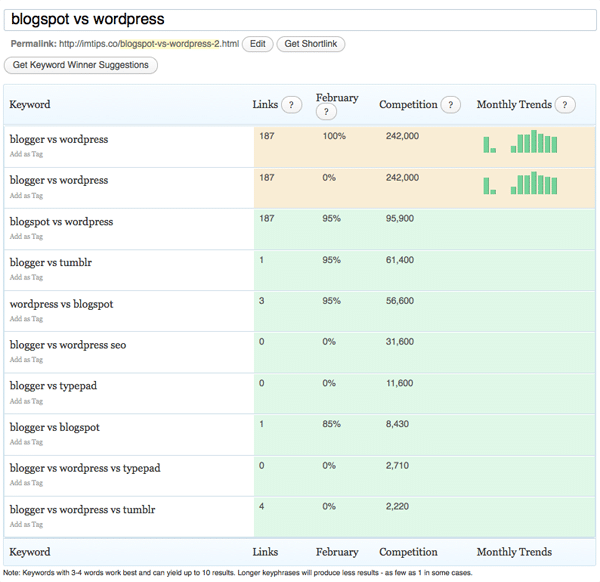 Very clear that Blogger would be better keyword than BlogSpot and Google Analytics confirms the same. Blogger Vs WordPress is 4th most popular post of IMTips and generates almost 10 times more traffic than BlogSpot Vs WordPress. What does Red / Green, Yellow Color mean? Isn’t this contradicting to the theory – Write for humans and not for search engines? Doing a keyword research does mean you are looking for terms that people are searching but are not getting what they are looking for and rank for those terms. So do keyword research for getting more readers (humans) to site. If you have more questions about Keyword Winner, Add them in comments below and I will be more than happy to answer them all. Keyword Winner is not a complete keyword research tool. It is just a handy tool inside WordPress admin area and can be used to find titles for posts. For complete Keyword research you can use tools like MarketSamurai (How I use it here). As keyword winner is not a complete keyword research tool you cannot use it to find keywords targeted by competitors and other such complex SEO operations. Keyword Winner shows backlinks needed for a page to rank. Taking that number too seriously will not help and so make sure you only use that number for comparing two terms in keyword winner interface and nothing more than that. The best thing I like about Keyword Winner is, it just sits in WordPress admin area and helps you get the keyword ideas as and when you are writing a post, so you don’t need to pull out applications to know the basic information like competition and search trend about a keyword that just hit your mind in the middle of writing a blog post. Choosing a keyword is the most important weapon to bring traffic to your site and Keyword Winner just helps you get that done easily without any hassle and inside your WordPress admin interface. Whats that blogger vs wordpress table, cannot understand. I am using Keyword Winner since 3 months now I have to admit that this plugin is worth every penny! You can do all the researh without the tool but it is fast and easy to use and it will hit you up with hunderts of new visitors to your blog if you use the wright headings and titles. Yes, right title can take you far in SEO.